Combine cornflake crumbs, egg substitute, milk, dill, black pepper, and hot pepper sauce in large bowl. Add salmon; mix well. Shape salmon mixture into 5 large egg-shaped balls. Flatten each ball into 3/4-inch-thick oval. Pinch one end of each oval to make tail shape. Spray large nonstick skillet with cooking spray. Cook fish over medium-high heat 2 to 3 minutes per side or until firm and lightly browned. Turn fish over, adding oil to skillet, as necessary, to prevent sticking and increase browning. 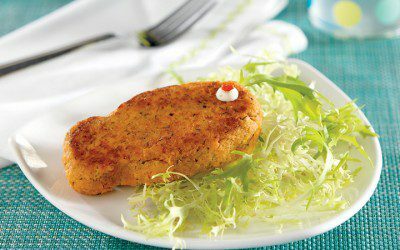 Place small drop tartar sauce and pimiento on each fish to make “eye.” Serve with remaining tartar sauce, if desired. Serving Suggestion: For a tasty side dish of sea plants, serve fish on a bed of shredded Romaine lettuce and matchstick-size cucumber slices. Serving size: 1 salmon patty. Exchanges per serving: 1/2 Bread/Starch, 11/2 Fat, 21/2 Meat.